Walnut Creek single family home sales have slightly underperformed in 2011 versus 2010. The number of single family homes sold remained flat while median prices dropped a little over 7%. The attached home market mirrors San Ramon very closely with unit sales up but a significant decline in the median home price. The average time to market a home increased a little over a week from last year. Keep in mind that all real estate is local and neighborhoods will and do perform differently. Please contact me if you would like additional information on the Walnut Creek Real Estate Market. 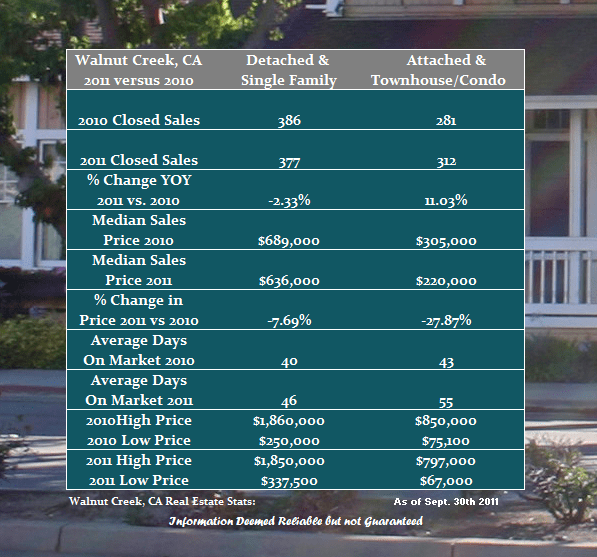 Share the post "Comparing Walnut Creek Real Estate Sales 2011 vs 2010"